The quality of democracy in industrialized states is steadily declining. At the same time political polarization is growing, making it more difficult for states to implement sustainable reform. This is the finding of a recent study by Bertelsmann Stiftung which measures Sustainable Governance Indicators for 41 OECD and EU countries. 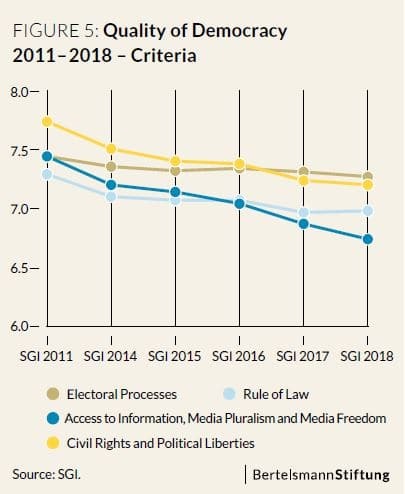 Since 2014 the democratic and constitutional standards have declined in 26 of the 41 countries, the study finds. Most worrying are the results for Hungary, Poland, Mexico and Turkey – but also the United States. The world’s largest national economy fell nine places in the democracy index, while Poland experienced the most serious decrease and plummeted 29 places. 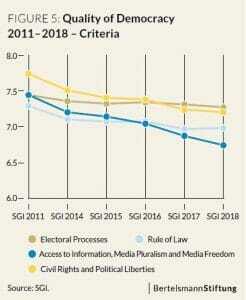 In terms of democratic standards, press freedom has experienced the steepest decline. What is alarming in this regard, says Daniel Schraad-Tischler, co-author of the study, is that despite the declining quality in democracy, trust in the government has actually increased in these countries. This shows that “the model of liberal democracy is also coming under increasing pressure in the OECD and the EU,” explains Schraad-Tischler. The decline of democracy has thus become a global issue. It also affects developing and transformation countries, as the Bertelsmann Transformation Index shows (see our report here). Another key finding of the study is that while the quality of democracy decreased, political polarization is on the rise. There is an increasing division between “the left” and “the right”, which creates difficulties for the effective day-to-day work of governance and the capacity of states to implement reforms. Even countries with the highest quality of democracy – the Nordic countries, followed by Germany and Switzerland – experience the pressure of growing political polarization. Populist parties are exploiting emotions, making fact-driven compromise across party lines more difficult. Some governments, in countries such as the United States, Hungary and Turkey, even deliberately fuel social tensions instead of softening them. If governments “want to counter political apathy, they should offer solutions designed to ensure long-term success and resolve rather than reinforce lines of conflict,” recommends Bertelsmann Stiftung chairman Aart De Geus. Globalization, social inequality and climate protection all present enormous challenges to OECD and EU countries and in regard to them, more vigorous reforms should be expected. But the problem-solving capacities of OECD and EU states have fallen in recent years. A development that is connected to a decline in key aspects of “good governance”. The diminished capacity to solve problems weighs heavily on states. “Despite economic stabilization since the financial crisis, social inclusion in many OECD and EU countries – especially in the hard-hit Southern European countries – hasn’t yet returned to prior levels,” says Schraad-Tischler. Bertelsmann Stiftung has used the Sustainable Governance Indicators regularly since 2011 to analyze the viability of OECD and EU states. The cross-national study analyzes the quality of democracy, governance and policy outcomes in the areas of economics, social affairs and the environment for 41 countries, drawing on a comprehensive set of 140 indicators. The full study is available here as PDF.